Enrich your life and your art by joining in a variety of Watershed’s year-round programs and activities. Learn about Watershed on a tour of our facilities and meet resident artists in the studio. Area residents and visitors in midcoast Maine look forward to Watershed’s signature annual events—Salad Days and the Soup Bowl Supper. Salad Days – Mark your calendar! Each year, Watershed hosts our summer celebration feast featuring handmade plates, Salad Days, on the second Saturday in July. Each guest selects a hand-crafted earthenware plate (to take home) and can load it up with an array of salads, breads, and desserts—many sourced locally and prepared by Watershed’s cooks and area restaurants. In addition to the festive meal, there’s a pottery sale and exhibition, live music and artist demos. Learn more. 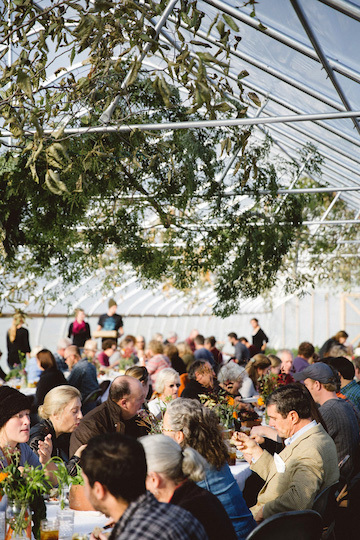 Soup Bowl Supper – Celebrate spring’s arrival at Watershed’s annual Soup Bowl Supper, hosted in partnership with the Boothbay Harbor Rotary. The community dinner features handmade ceramic bowls, and all-you-can-eat chowder, soup, salads, breads and desserts. Funds raised support the local emergency fuel fund and Watershed’s community education programs. Learn more. Each year, Watershed hosts or participates in a variety of public events—including community art walks, farm-to-table dinners, open house days, artist gallery talks, and more.